Ballaghaderreen is a town in the west of Ireland that is determined to fight back. Like many similar-sized towns in the region, it has suffered enormous setbacks, and was clobbered during the recession. It still bears the scars of the crash. If Enda Kenny had opened his eyes here on his way back to Mayo before the last election, he would never have allowed his handlers to mount a campaign with the slogan, “Let’s keep the recovery going”. In these parts, the slogan would have been seen as a sick Dublin 4 joke. One year on, and there Are still few enough signs of recovery. The town now relies for much of its employment on the Aurivo dairy plant, powered by burning biomass, which looms large as you enter from the Dublin side. It processes 250m litres of milk annually for export as milk powder all around the world. But the meat plant for which the town was once renowned has long gone. Ballaghaderreen had a building boom driven by tax incentives during the Celtic Tiger era with new housing estates built, and the construction of a business park. Then, just as the economic crash got going, the Dawn Meats plant, a hub of economic activity, shut down with the loss of 200 jobs. By 2011, unemployment in the town was running at 32pc. Most of the space in the industrial park remains unoccupied, and there are still hundreds of empty homes with moss gathering in their driveways and growing out of the gutters. Some of the shops remain vacant. This is as far away from the overheated property market of south Dublin as you can get — and that in itself may offer the town an opportunity. On my visit I came across a four-bedroomed semi-detached home, “in need of some refurbishment”, on sale for €37,500. Earlier this year, it was announced that another significant employer, the ECMI cigar factory, is to shut down. On the face of it, the town’s future looks bleak, but as in hundreds of other towns up and down the country, there are local community leaders working to turn around Ballaghaderreen’s fortunes. They are not going to give up easily. You can see their efforts in the tidy streets, the freshly painted shop fronts and the neat window boxes of flowers. Both schools in the town, St Nathy’s and St Attracta’s, have first-class reputations and bring a buzz to the centre of the town during term time. A new CoderDojo branch is being set up to teach youngsters about computer coding. The town is also attracting good publicity for the warm welcome given to more than 100 Syrian refugees who are living in the converted Abbeyfield Hotel. In enclaves such as this, there is usually a handful of people who pop up everywhere, and Micheál Frain is one of those pillars of the local community in Ballagh. 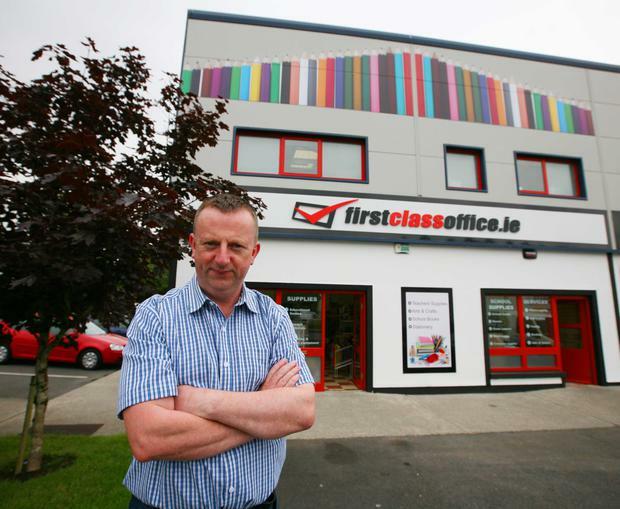 As well as running his own stationery and school supplies business, he is chairman of the “town team”, which is making strenuous efforts to regenerate Ballagh. And he is chairman of the Roscommon Leader Partnership, which aims to boost rural enterprise and provides various community services. As if that were not enough, Frain is also the chief fire officer in the town. He could be called at any time of the day or night with his crew of part-timers to put out a blaze or attend the scene of an accident. “I suppose you could say that I have a few different hats,” he says, as he shows me the two gleaming red fire engines standing in the station. Describing himself as a “glass half-full man”, Frain has an optimistic vision of Ballagh in the future as a financial services centre, only 15 minutes’ drive from Knock airport. “People are very unified here about wanting the betterment of the town. “We have had our fair share of hard knocks over the years with job losses, but people here are resourceful,” he says. Frain and others on the “town team” now want to promote Ballagh as a “creative town”. True to form the town has a Douglas Hyde conference starting in the next few days, followed by a Lakes and Legends festival. And Ballagh is getting plaudits for its quirky Secret Village music festival, described by its many admirers as a mysteriously hidden “Electric Picnic of the west”. Frain says the days of big multinationals coming to small areas like Ballaghaderreen to set up advanced factories built by the IDA may not happen, but he hopes that the town can attract many different types of new ventures. With a half-empty industrial park and houses at knockdown prices, Frain believes an area such as Ballaghaderreen could offer a solution to some of the problems of congestion along the east coast. A woman told me that the big problem with Ballaghaderreen is that it is a town caught between two stools. It cannot decide whether it is in Mayo or Roscommon, and has something of an identity crisis. When the football championship heats up, it is a town divided between the red and green of Mayo, and the primrose and blue of the Rossies. Until the end of the 19th century, Ballagh was actually in Mayo. But then in a political stroke of the sort that would make even the present generation of politicians blush, the MP John Dillon is said to have had it moved into Roscommon — apparently so the traders in the town could avail of lower rates. But for GAA purposes, Ballagh remains stubbornly attached to Mayo, where it was back in the 19th century. The best players from Ballagh get on the Mayo team, and one of the local pubs Durkin’s proudly displays a red and green shirt, signed by all the Mayo team members. Some feel that the administrative bigwigs in Roscommon are never going to do the town any favours, out of resentment about losing some of their best players to the neighbouring county. In its heyday, there were 68 pubs in Ballaghaderreen, but one drinker told me there are no longer the dozen required for a Christmas pub crawl. In Durkin’s bar, I met up with three Syrian refugees, who are now living in the revamped Abbeyfield Hotel. Sipping coffee in the bar, Kamel Shaaban, Ghassan Shamet and Fahima Neami are all excited and full of hope as they embark on their new lives in Ireland. But having escaped a war zone, they are concerned for their families in Syria. The refugees will spend a few months in Ballagh in the Emergency Reception and Orientation Centre before moving on elsewhere. Fahima, who worked as a lab assistant and journalist in Syria, felt relieved when she arrived in Ballaghaderreen to be safe and to be free. But she wishes the transport links were better, so she could get around more. When the Government announced that refugees would be put up in Ballaghaderreen there were some initial local reservations. Micheál Frain was disappointed that the hotel, which is sorely needed in the town for functions such as weddings, would not be reopening in the short term. He has been involved in efforts to boost Ballagh as a tourist centre with a lakes and legends theme. But once the decision was made to put up the refugees in the revamped hotel, the community rallied around to ensure that the new arrivals would be made as welcome as possible. When they found out that a number of the refugees were in their age group, members of the local Foróige youth club went into overdrive, and organised a series of events for them. They put together a welcome poster, translated into Arabic, informing the Syrians about their club, as well as individual messages. They also invited them to a special welcome evening with activities such as pool, clay modelling, and Connect Four. The youth club leader Theresa Geever says: “I think the members of the youth club found that they have a lot in common with the Syrians. A group of local residents held a public meeting to work out how the refugees could be helped, and a Welcome to Roscommon group was set up. Two local residents, Jessamine O’Connor and Carol Wilson, are among those who stepped forward to teach English to the Syrians through the voluntary organisation Fáilte Isteach. “At the start I wasn’t sure how many of the refugees would want to do the class, and then 25 turned up on the first day,” Jessamine says. One of the teachers, Carol Wilson, who is originally from Oxford, was herself attracted to Ballaghaderreen by the low property prices. She bought her house in the town for €34,000 four years ago, and has been delighted by the move. Ballaghadereen already has an immigrant community of up to 200 Pakistanis, many of whom used to work in the halal meat plant that was once located in the town. They have helped to turn Ballagh, usually best known for GAA, into an unlikely cricket stronghold. Not long after the club was set up a decade ago, Ballaghaderreen became Connacht cricket champions and have won several titles since. Saj Hussain, who works as a barber in the town, helped to set up the cricket club and has also been instrumental in welcoming the Syrians. He has organised football matches between members of the local Pakistani community and the refugees. There is no doubting the community spirit in Ballaghaderreen — and parents are full of praise for the schools. Many of this year’s Leaving Cert students at St Nathy’s will go on to third-level colleges in Sligo, Galway and Dublin. All that is now missing in Ballagh are the jobs required to lure them back. That is the town’s big challenge.